Agriculture, food security, and rural development: buzzwords that seem to be trending in the last few years. Most would agree that this is a welcome development, especially after decades of relegating Africa’s agricultural development to the background. With the endorsement of the Comprehensive Africa Agriculture Development Programme (CAADP) by African Heads of States in 2003, the continent’s agriculture and food security agenda returned to the spotlight. Just going by numbers, one can say that CAADP has progressed quite well at the national level: over 27 countries have launched compacts and are at one stage or the other of developing or implementing an investment plan. The regional dimension, however, has not progressed at the same rate. 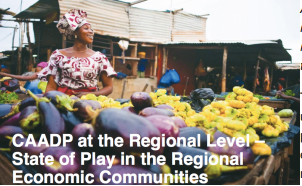 Most Regional Economic Communities (RECs) have yet to launch a regional compact, despite of the fact that key actors recognize the importance of regional action on agriculture. (1) Yet, there are important lessons to learn from the different African regions on their approaches to food security, especially within the framework of CAADP. 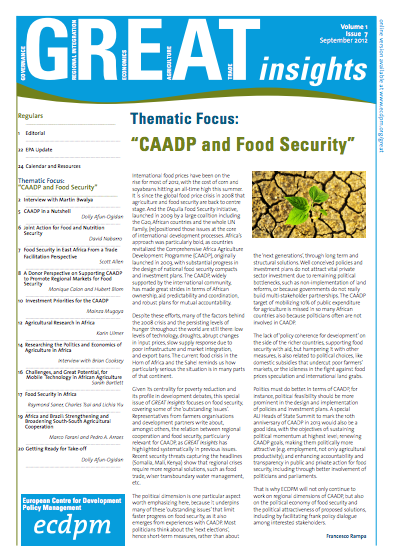 As momentum around regional CAADP increases, it is important to identify what concrete actions are needed, clarify the roles different stakeholders should play and jointly agree on how support can be coordinated. Starting with the Economic Community of West African States (ECOWAS), GREAT will publish a five part series to share findings from a regional CAADP mapping exercise. 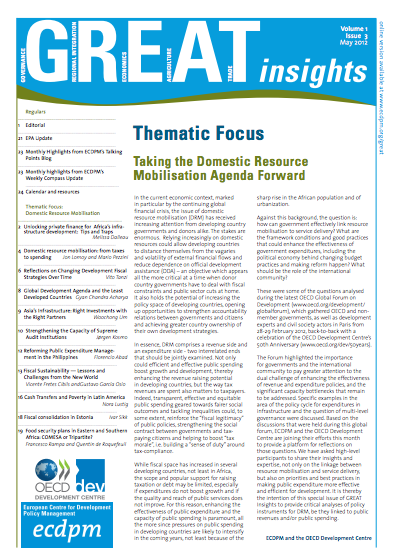 (2) Each monthly article will highlight lessons learned from one of four African regions (COMESA, EAC, ECOWAS and SADC). A fifth final article will summarize and present crosscutting lessons relevant for successful implementation of the CAADP process at the regional level. 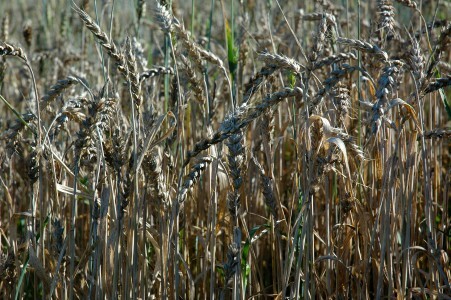 Agriculture plays a key role in most West African economies. The sector represents on average 36 percent of national GDP and employs over 60 percent of the active labour force in the region. (3) Yet food security still remains a challenge across the region. 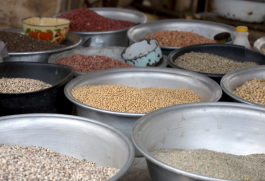 The food crisis in Sahel parts of the region is a recent reminder of the urgency for and importance of concrete and well delineated regional action to improve agricultural development and address impediments to food security in West Africa. ECOWAS is seen as a region that had made considerable progress in articulating a regional approach for agriculture within the CAADP framework. As far back as 2001, ECOWAS initiated and adopted a framework of guidelines for the creation of a common regional agricultural policy for West Africa (ECOWAP). This conveniently coincided with the period when CAADP gained momentum and global interest. By 2005 the ECOWAP was adopted as the reference framework for CAADP implementation at the regional level in West Africa. The ECOWAS CAADP regional compact was launched in 2009, followed by the Regional Investment Plan (RAIP) in 2010. A Regional Agency for Agriculture and Food (RAAF), Regional Fund for Agriculture and Food (ECOWADF) and a Strategic and Operational Plan is currently being set up to implement the ECOWAP and its RAIP. The ECOWAS Commission was also quite proactive in supporting its member states along the CAADP process at the national level: it provided technical support and financial assistance of over USD 0.4mn to each member state to organize the national CAADP compact and investment plan formulation process. West Africa’s regional CAADP processes show that it is possible to catalyze political and investment traction for regional cooperation on agriculture. The ECOWAP process provided a rallying point for a wide range of key actors, from national governments to the ECOWAS Commission, to the regional farmers representation, and development partners- to align to the region’s agricultural development priorities. But the process has also shown that drafting a regional compact document requires both regional and national actors think through and jointly identify what issues can best be addressed through regional actions, and ‘task-divide’ on the identified priority actions. Coherence between the ECOWAP and national CAADP compacts is not visible enough. Although no analysis has been undertaken to check to what extent national compacts complement the ECOWAP, it is generally understood that the national compacts of ECOWAS member states are predominantly inward looking and do not sufficiently recognize the cross border linkages that exist between member states. The ECOWAP also includes interventions, such as the co-financing of social safety nets, which many believe could be better dealt with by member states and their compacts, rather than the regional compact. There is space to clearly identify the roles and the responsibilities of the member states versus ECOWAS Commission vis-à-vis the ECOWAP. Beyond member states and the Commission, other key actors for the implementation of the ECOWAP include farmers and the private sector. In general, the ECOWAS Commission has been commended for promoting an inclusive and multi-stakeholder approach and there is a perception of broad based ownership for the ECOWAP. The regional compact preparation process served as a platform to bring together regional and national Non-State Actors (NSA), giving them a somewhat stronger role and voice. The Network of Farmers’ and Agricultural Producers’ Organisations of West Africa (ROPPA), the regional farmers organization, and other agro-businesses were closely involved in the compact development process. But there is an opportunity for increased private sector collaboration in the monitoring and implementation phase of the RAIP. ECOWAS’ experience shows that the political will and ability of a REC to drive CAADP is a major determining factor for the success of this framework at the regional level. Nevertheless, the Commission still struggles with institutional weaknesses and capacity deficits, which has led some donors to channel funds through non-governmental organisations, UN-type or multilateral institutions rather than the ECOWAS Commission or the ECOWAS Bank for Investment and Development (EBID). There is a feeling that financing the institutional capacity of the ECOWAS Commission and other agencies affiliated with ECOWAP should be the responsibility of member states, not donors. On the donor side, the ECOWAP/ RAIP has provided a good rallying point for them to align to the region’s priorities and strengthen their harmonization. A regional Donor Working Group (DWG) has been set up around the ECOWAP to support regional initiatives and plans around CAADP. Donors and the ECOWAS Commission generally perceive this as a well-functioning and useful platform. The DWG has adopted its own rules of procedure, and meets once a month. It presents a good platform to share information among donors and formulate joint positions for discussions with ECOWAS. Staff members of ECOWAS’s Department of Agriculture and Rural Development (DARD) often attend the working group’s meetings. Yet, improvements can be made. Because regional development partner representations are often spread across countries in the regions, information exchange between national-regional levels is still fragmented. Actual harmonization still remains a challenge. The implementation of regional CAADP has the potential to significantly contribute to overall regional integration and cooperation efforts. 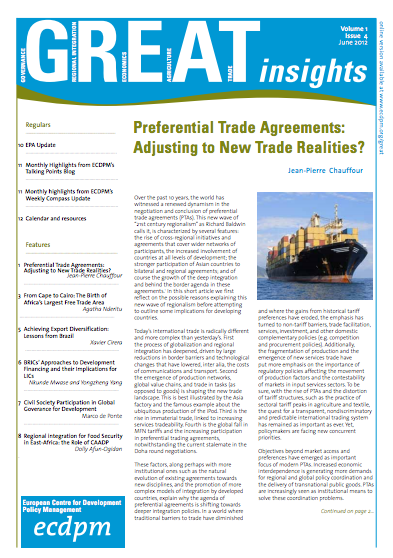 But bottlenecks for regional integration are still very present in ECOWAS. Mismatches between regional processes and dynamics and the gap between regional commitments and their application at the national level, amongst other problems, could limit the potential of ECOWAP to promote regional agricultural cooperation and development. In this regard, an obstacle to regional integration is that ‘regional thinking’ is not institutionalized in many member states, and arbitrary unilateral policy measures are still common and contradict basic principles of regional cooperation. Because agriculture is inherently linked to other sectors, slow action on regional trade, infrastructure, and other related regional initiatives have consequences for regional food security and agricultural development. ECOWAS is a pioneer in developing regional approaches for CAADP. Nevertheless, some challenges remain in order to fully capitalize on the lead that ECOWAS has taken in developing regional CAADP approaches. The first of these challenges concerns the relationship between regional and national level CAADP processes. As stated above, the links, synergies and coherence between these two levels could be strengthened. What, exactly, should be undertaken regionally and what should be undertaken nationally is still not entirely clear in ECOWAS’ CAADP. This suggests that there is clearly for some room for improvement on the application and definition of the subsidiary principle in the region. Secondly, the important role that NSAs have played in the CAADP process has to be kept up and deepened in the monitoring and implementation phase. The experience of involving non-state actors has been, on the whole, satisfactory, and their involvement must be ensured in the future. Inviting national farmers and agro-business employers associations more often to take part in regional processes could be a first step in this regard. Thirdly, the capacity of the ECOWAS Commission to implement the RAIP is uncertain. The DARD, in charge of implementation the regional investment plan, is currently understaffed and weak. This should be addressed in the ongoing institutional assessment of the ECOWAS Commission. It is uncertain whether the creation of the Regional Agency for Food and Agriculture, the newly announced regional agency in charge of implementing the PRIA, could help fill this gap. In any case, institutional coordination between different bodies in ECOWAS will be key in determining the ability of the Commission to deliver on the RAIP. Fourthly, donors could step up efforts to reduce the bewildering amount of programmes and projects, currently existing and build on the working group present in the region to align and harmonize their programs. Joint programming is a promising option that should be explored. Finally, the linkages that exist between ECOWAP/CAADP and other areas of regional integration, which will necessarily impact food security, have to be taken into account. Recognizing and capitalizing on the synergies that exist between cross-cutting sectors, such as trade, infrastructure, natural resource management, etc and agriculture are relevant for achieving the objectives of ECOWAP. These synergies could be explored in more detail during the ECOWAP/ RAIP implementation process and through multi-stakeholder dialogues, where actors will be able to discuss coherence, complementarity and coordination of specific ECOWAP actions with other policies and investments. This could be facilitated by inter-departmental and cross-sectoral information exchange and coordination, within the ECOWAS Commission, regional and national bodies, and within development partners’ departments and agencies. 1. The 7th CAADP Partnership Platform in Yaoundé recognized the need for accelerating the development and implementation of regional CAADP compacts. 2. 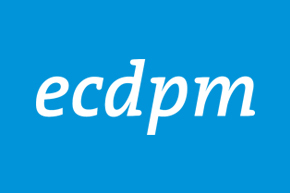 ECDPM was given the mandate by the CAADP Development Partners Task Team (DPTT) to conduct a series of mapping exercises of the CAADP regional process in COMESA, SADC, EAC and ECOWAS. The mapping assessed the major challenges and opportunities for the design and/ or implementation, as the case may be, of a regional CAADP compact. 3. ECOWAS Commission. 2011. Strategic and Operational Plan of the ECOWAS Commission for Governance, Coordination and Monitoring and Evaluation of the Regional Agricultural Policy of ECOWAS – (ECOWAP/CAADP) 2011-2015. Abuja: ECOWAS Commission.